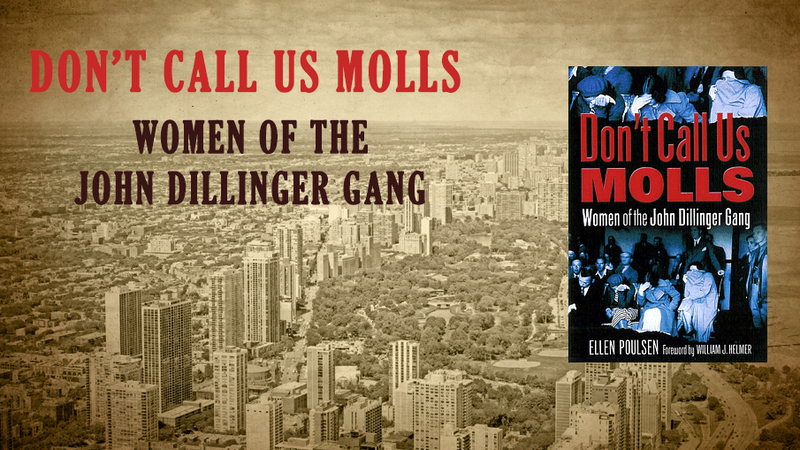 "Don't Call Us Molls: Women of the John Dillinger Gang"
New York: Clinton Cook Publishing Corp. Copyright c. 2002 by Ellen Poulsen. Original Edition. 6 x 9, Paperback. 520 pages, with 85 photos and illustrations. ISBN 0-9717200-0-2. $19.95. Publication November 2002. The author is an active member of the Combined Book Exhibit Network; Partners In Crime (PIC); and Independent Book Publishing Associattion (IBPA), and a participant in The New York Small Press Center & 2004 Chicago Gangster Convention. This site updated on January 2, 2016. The book is in print. Any orders that go directly to the publisher via this web site will be filled within 5-7 business days. This non-fiction book explores the collective experience of the Dillinger "gun molls." This exciting book reveals their human qualities as viewed through relationships to John Dillinger, Baby Face Nelson, among others. As wives and girlfriends of the Depression-era's public enemies, they shift through continuing themes of expectation and disillusionment. Their conflicting loyalties are challenged by the unrelenting pressure of the U.S. Government to betray their men.